Today Oscar and I went on a date. Leaving the house was my priority to get my mind off of being NOT in labor. And we have a few weeks left of morning movies this summer so we decided to go. We saw Bee Movie and enjoyed every minute. We even met some friends for a bit but parted ways mid-movie. As it was getting closer to naptime, Oscar offered me some rare snuggle time. Of course this always melts my heart, but he really laid it on when he held my hand and asked for a kiss on the mouth AND a hug. 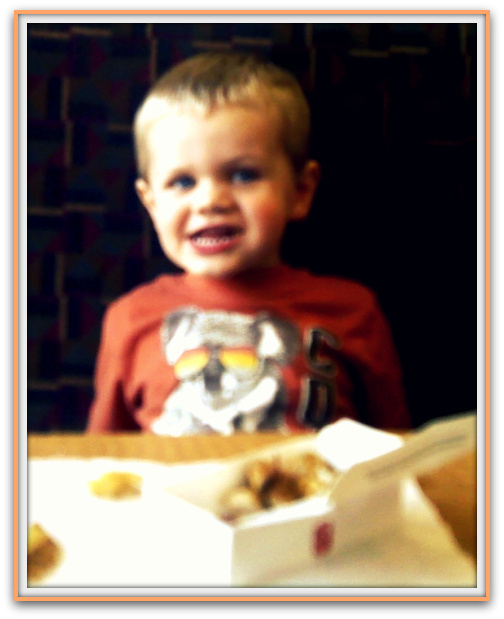 After the movie, we had lunch at Chick-Fil-A and again he was totally agreeable and fun. The manager even gave us each a mini taste of the the new Peach milkshake (yum) and we both had lemonade. It wasn’t until we got home and I laid him down for his nap that I realized this will probably be our last date just the two of us. I know we will have special times where it’s just us or just he and daddy, but our family of three is about to become four and it will all change. I know it will change for the better, but I still cherish these past 2.5 years when we were simply three. Oscar is the best son a mother could ask for and I know he is going to be an amazing big brother. I am so proud to be his mama and while the waterworks are going as I type (blaming hormones here) I am not sad. Big hugs mama! He’s going to make a wonderful big brother. So glad you got this special moment. So sweet! Every time we’ve grown our family, I’ve been hyper aware of how the dynamics will change. And they WILL change, but maybe you’ll find like I did that after an initial period of adjustment, you’ll find these same little bits of time when it’s just the two of you again. I’ve been SO grateful over the years to be able to return to these moments with each of our five kids, and really, for just a minute, you’re on your own little island together again. Good luck to your sweet family – it’s going to be fantastic!! Very sweet! The last few moments before the 2nd child is born is too precious. Glad you’re really enjoying this time! Such a sweet post. So sweet. What a special time. If you’re back online after the baby, I would love to have you join me for my link up on 8/1/2011. My latest post has some details. So important to have dates with the kiddos before (and after) #2 comes. Things are definitely going to change, your relationship with Oscar, but you’ll see the love between your two kids and it’ll make everything worth it! Hang in there momma, thinking about you! Precious! I still take one on one outings with my kiddos. I have three and I cherish my special quiet time with each of them just as much as our family time together. Awwww, sounds like a wonderful day. Aww. Love this. You’re such a good mama and Oscar is going to be the BEST big brother! Can’t wait to see the new addition! what love and pride radiates from this post. a special day, for sure!